The legacy data portal remains online. A new data portal with increased functionality is under construction. Data can be accessed via anonymous ftp. Caldwell, P. C., M. A. Merrifield, P. R. Thompson (2015), Sea level measured by tide gauges from global oceans — the Joint Archive for Sea Level holdings (NCEI Accession 0019568), Version 5.5, NOAA National Centers for Environmental Information, Dataset, doi:10.7289/V5V40S7W. This citation refers to the Research Quality dataset archived by the NOAA National Centers for Environmental Information as the Joint Archive for Sea Level. As discussed below, Fast Delivery data is replaced by Research Quality as it becomes available. Only the most recent Fast Delivery values are not included in the Research Quality archive. If you use Fast Delivery data, please use the citation above and note the date through which Fast Delivery data was obtained. The UHSLC offers tide gauge data with two levels of quality-control (QC), where more rigorous QC requires more effort and a greater time-lag. Fast Delivery (FD) data are released within 1-2 months of data collection and receive only basic QC focused on large level shifts and obvious outliers. FD data are replaced in the data stream by RQD (see below) as the latter becomes available. Research Quality Data (RQD) receive thorough QC and are considered to be the final science-ready data set. This final QC process is time-consuming, and as a result, the RQD are released 1-2 years after data is received from the data originators by the UHSLC. Real-Time (RT) data, which feeds the international tsunami networks, are available from the UNESCO IOC Sea Level Monitoring website hosted by the Flanders Marine Institute (VLIZ). The UHSLC maintains one of the largest global networks of tide gauges that feed the FD stream, but there are numerous other international agencies that contribute. These FD data are received from partner agencies on a monthly basis and incorporated into the FD stream. The RQD is maintained by Pat Caldwell and archived as the NOAA Joint Archive for Mean Sea Level (JASL). FD data is included in the RQD after final quality-control, but the RQD includes many more sites from countries with less technical capacity for fast data turn-around. The JASL is also active in historical data rescue. The Permanent Service for Mean Sea Level is the primary GLOSS repository for monthly data, and in order to avoid confusion, the RQD is only available from the UHSLC at hourly and daily resolution. All RQD are sent in annual updates to the PSMSL to be incorporated into the monthly data stream. What is the difference or offset between given sea level values in the data files and mean sea level? The term ‘mean sea level’ is arbitrary, as it refers to the average sea level over any given span of a time series. Thus, the offset of a given sea level value to mean sea level depends on the user-determined epoch over which mean sea level is calculated. When defining mean sea level for any application, be sure to give the time span over which the mean is defined to avoid confusion. Most national tide gauge networks define a specific datum for each tidal station. See the NOAA CO-OPS website for a more detailed discussion of tide gauge datums. From historic data, an epoch or time span is chosen to calculate the mean sea level. Once calculated, one can then define the height of tidal species, such as mean lower low water, or a chart datum relative to the station datum (zero reference level). To what benchmark are these values referenced, and what is the difference or offset? The station datum, or zero reference level for a tide gauge time series, is defined by its relationship to fixed, land-based benchmarks. Information about the benchmarks and historic geodetic field measurements amongst the benchmarks and the station datum are available upon request for stations within the UHSLC network. For other stations, one must contact the data originators. In some cases, the station datum can be a chart datum or another specific datum, such as a national geodetic datum, depending on how a given agency defines the tide gauge series reference zero. When available, information is provided in the station information file (metadata) on how to convert the station datum to other datums (chart, national, etc.) or benchmarks. What is the zero or datum for these values? For a given time series of sea level data, the zero is an arbitrary value, which can be the station datum or other originator-defined reference level. The important aspect is that all values for a given time series have the same zero reference. The definition of the zero reference is given by the originator, who takes care to ensure the reference point is linked through periodic, geodetic surveys to land-based, fixed benchmarks. Why do some stations have multiple series (for example, Honolulu-A, Honolulu-B)? A single station may have multiple time series if segments of time refer to different zero reference levels. This can occur if a new station is established in a location with historic tide gauge measurements, but it is not possible to link new and historic benchmarks. What is the difference between sea level data from tide gauges and sea surface height from satellite altimeters? Data at http//uhslc.soest.hawaii.edu/data are tide gauge data. It is a measure of sea level relative to a defined datum (zero reference), which is linked to fixed, land-based bench marks. Thus the measurement is “relative” to the land on which the benchmark is established. If this land is sinking, then it will appear in the data as a relative sea level rise. Each tide station has a unique datum (zero reference). Sea level data from tide gauges are different than sea surface height measured by satellite altimeters, because at the latter is measured relative to a global reference frame (not local benchmarks). As a result, sea surface height data from satellite altimeters are not affected by land movement. Are the higher frequency data (sub-hourly) recorded by the tide gauge archived? The raw sub-hourly data for gauges maintained by the UHSLC are not archived, primarily because the UHSLC is not funded to do so. Each sensor has multiple sensors and some sensors can have multiple recording mechanisms. The cross-checking of the data streams is an essential part of quality-control, and the highest-frequency data requires expert attention to make a scientifically-valid product. Locally, the raw data within the UHSLC global network are backed up for short-term preservation, but it is not intended as a posterity archive. It is unconfirmed how other international agencies handle the archiving of their raw data streams. The NOAA NGDC (www.ngdc.noaa.gov) does archive select high frequency data sections pertaining to specific events (e.g., tsunamis). Discussion at GLOSS meetings has suggested the GLOSS IOC Sea Level Monitoring Facility as the most logical repository for raw data streams. The Monitoring Facility does back-up these streams, but as of yet, there is no official posterity archive for the raw data. What is the accuracy of the timing? Modern gauges use computer-based clocks or GPS for defining time. The accuracy is high, on the order of seconds. In historic data from older gauges, there are two main sources of timing error – 1) drift of the data acquisition clock and 2) clogging of a stilling well orifice. Timing errors are best seen in plots of residuals, which are defined as tide gauge observations minus predicted tides. Timing errors from clocks can have fixed offsets or drifts in time positive or negative. One can learn of such errors from station maintenance records or from studying residual plots. Notes regarding the quality of the timing are made in the quality assessment files for each station. Affects of clogging typically have a trend as the degree of clogging worsens. When such features are identified, notes are placed in the station quality assessment file. Currently, clocks are reset and stilling wells cleaned during tide gauge maintenance visits to keep these errors to a minimum. What are some good, contemporary references about sea level science and data? Church, J.A., P.L. Woodworth, T.Aarup, and W.S. Wilson, 2010: Understanding sea-level rise and variability. Wiley-Blackwell. London. ISBN 978-1-4443-3451-7. IOC, 2012. 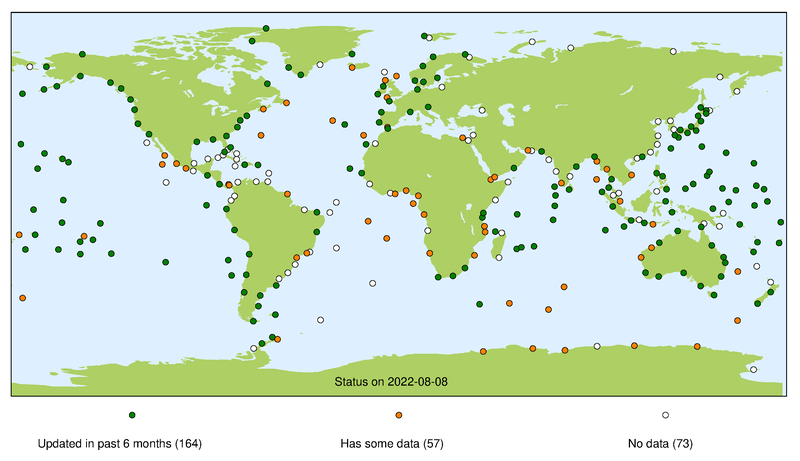 Global Sea Level Observing System (GLOSS) Implementation Plan – 2012. IOC Technical Series No. 100. Paris, France. May 2012. The UHSLC datasets are GLOSS data streams (read more here). There are many tide gauge records in the UHSLC database, but the backbone is the GLOSS Core Network (GCN) – a global set of ~300 tide gauge stations that serve as the foundation of the global in situ sea level network. The network is designed to provide evenly distributed sampling of global coastal sea level variation at a variety of time-scales. For more information on the selection and standards required of GCN stations, please see the GLOSS Implementation Plan 2012. The maps to the right show the status of GCN stations in the UHSLC data streams (graphics courtesy of PSMSL). For each stream, the colored circles indicate whether a site is operational (green marker), has been operational in the past (orange marker), or never operated successfully for that particular stream (white marker).